Shrding Old Street is located at New Taipei City, Taiwan. 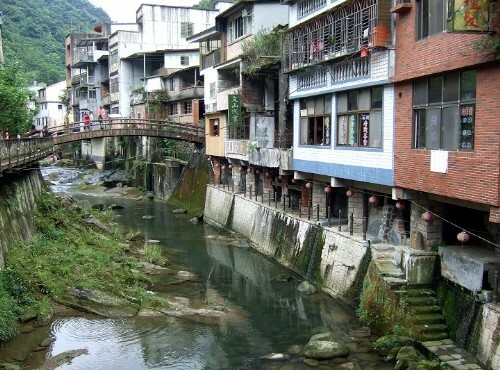 It is a small town in the mountain, and there is a river passes through and cut the town into east and west half. The houses are set on the both side along the river, and the highest bridge was built for the connection. A special scene that visitor may see here is a tunnel liked street; the streets are among the houses and are built above the river. The reason of this spectacular view was due to the prevailing coal mine industry. The mine diggers used poles to lift the house in order to spare more placers for coal mining. Shrding was a thriving town back to the Qing dynasty, because its geographically favorable condition for resting located in the middle of the way to Yilan. The town could continuously maintain its prosperousness thanked to the coal mine and tea trade. Visitors may enjoy the aromatic tea among the glorious landscape, as well as the local delicacies such as tofu ice-cream and awarded rice dumpling. In addition, the traditional handcraft may be discovered here. The last traditional blacksmith factory displays the stunning heritable skill, and a rare handmade knife can be purchased in the factory. Shrding Old Street is usually not crowded as other popular old street in Jiufen, Sanxia, Neiwan or Lukang, which makes the surroundings more relaxing and tranquil. Moreover, traveler may find the variety of retrospective houses present the combination of the eras and describe the development of the chronicle. Also, they may treat themselves a quality time by savoring the historical atmosphere, natural scenery, traditional handcraft, as well as the old flavored cuisine. No. 3 National Highway (國道三號) -> Exit from Shenkeng Interchange (深坑交流道) -> Tuku Road (土庫路) -> 106-B Line (106乙線道) to Shiding Old Street (石碇老街).